Losing a beloved canine sidekick at the end of their all too short lives is never an easy thing. 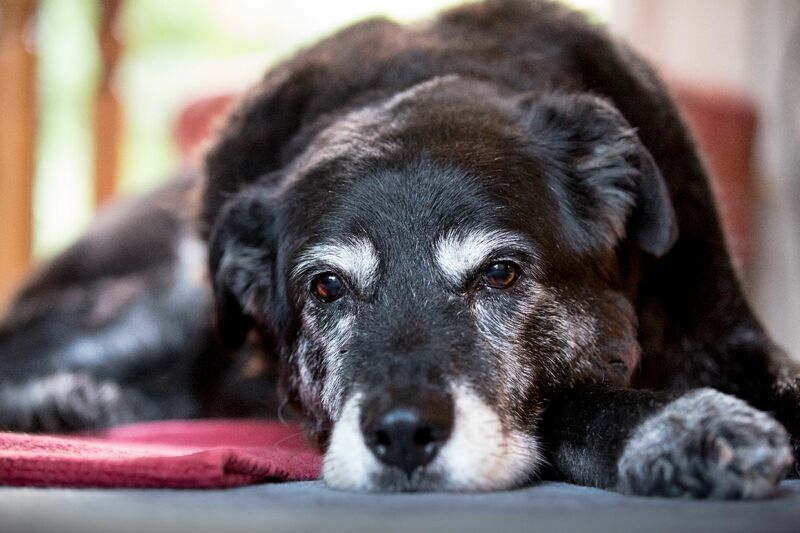 Having gone through it three times, myself, I am certainly no stranger to the pain and grief one feels when we’re forced to say goodbye to a dog with whom we've really bonded. Some people are so devastated by the loss, that they either wait for years before getting another dog or they never actually get another dog. Of course, different people will deal with the death dogs in different ways, and whether or not the dog was the only dog in the house or not can certainly play a factor. The lives of my first two dogs, for instance, overlapped – I got the second when the first was five years old. And, while the death of my first dog was one of the most devastating events of my life (I couldn’t go to work for a week), having the second dog still with me made it a bit more bearable. After my second dog died, I waited a full ten years before getting another, and, even then, I wasn’t looking to get another dog. One who I instantly fell in love with just happened into my life and needed a new home all at the same time. We bonded immediately, and he went home with me the next day. When he passed away, nearly eight years later, a close friend asked if I thought I would ever get another dog. My immediate response was "No." After three times, I honestly felt I couldn’t ever go through the pain again. The following week, I was driving home from a nearby ASPCA shelter with my current dog. Wait, what? How did that happen? How did I go from “Never getting another dog, because I just couldn’t go through the pain of losing one again” to a week later driving home with another dog? Seems crazy, I know. Wise words from a dear friend, who also happens to be a fellow dog lover, in a nutshell, is how I made such a stark and dramatic shift in my thinking in the course of less than a week. And this wasn’t just any dog loving friend, but one who herself had gotten another dog shortly after the devastating loss of a dog with whom she was incredibly bonded, so I really listened hard to what she had to say, and gave it much more consideration than I would’ve had it come from anyone else. You could never replace a dog you’ve lost. That is just simply not possible. But, by getting another dog, you are honoring the dog you’ve lost, and honoring the entire dog kingdom, because you’re taking all of the things you already have, your dog’s things, his bowls, his leashes, his bed, his toys, the car you bought because of him, everything you acquired for him, and giving them all to another dog in need. And, more importantly, you’re giving the love that you have for dogs in general to another dog in need. And, you are quite possibly even saving their life. I’m paraphrasing a bit, but that was essentially the message which completely changed my way of thinking about adopting another dog less than a week after losing my last. And, nearly two years later, I know more than ever that it was the right decision to change my way of thinking and to adopt my current dog. First off, he’s an amazing dog, and I am every bit as crazy about him as I was my first three. He was found on the street and taken into the shelter at about ten months of age. We met and instantly bonded. And, other than the few times had to go out of town without him, he has literally slept with me every single night since I adopted him. First off, if you have recently lost a beloved canine sidekick, my heart goes out to you. There are few things on earth as painful as that experience, in my humble opinion. It’s the loss of the constant source of unconditional love and constant companionship which makes it a loss like no other. Not getting another dog for a long time or maybe even ever, after losing one you’ve been bonded with for years, instantly returns a freedom to one’s life which may not have been experienced in many years. The total span of years covered by my first two dogs, for instance, was seventeen, so when my second passed at the age of thirteen and a half, it was the first time I had been without a dog for nearly two decades. That newfound freedom can be a great way to find other things on which to focus, thereby helping ensure we don’t fall into total despair over the loss. People often take long trips after their dog has passed away, because it’s the first time in years they had the complete freedom to do so, and because it’s a great way to keep them from dwelling on the pain and loss. Getting another dog, soon after one dies, for me, certainly did make dealing with the loss somewhat easier, but mostly because my new dog was such a handful – so much so, that on the second night, when he was restlessly walking over my face trying to find a spot on the bed to settle in, I started wondering if I had made a huge mistake in adopting him. But, the fact of the matter is, all of the attention he required helped get my mind off of losing my last dog, much the same way taking a long trip after losing a dog helps. Both require a lot of focus. In terms of grieving, some might argue that getting a dog so soon after losing one doesn’t allow sufficient time for grieving. I don’t agree. Grief is going to happen one way or other. If you truly love a dog, you are going to grieve, and probably a lot, when they die. But, grief is always incremental – it never occurs all at once. It can come in as a flood, as was the case when I lost my first dog and the pain was so great that I couldn’t go to work for a week, though that certainly doesn’t mean it’s over. But, it can also come in smaller spurts, as I have found to be the case with losing my last dog almost two years ago, but grief and the healing process continue just the same. We all have to deal with the death of a beloved dog in whatever way we feel is best, but I’m with my wise friend on this one. If you find the loss devastating, you are obviously a dog lover, who quite likely has many things and a great deal of love that, if you were to find the strength to give, could literally save the life of another dog. And you would never ever be replacing your lost dog, that truly is impossible, but you would be honoring them and the entire dog kingdom by saving another. And, what better way to honor and pay tribute to your beloved friend?